Male peacocks are justly admired for their brilliantly colored plumage. 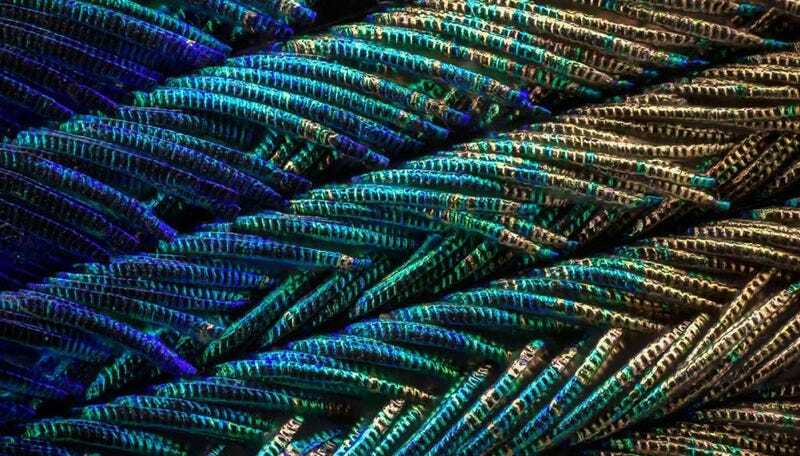 Canadian photographer Waldo Nell has captured the underlying microscopic structure behind those stunning hues in extraordinary detail in his latest photographic series. It all comes down to a phenomenon called iridescence, which can also be seen in the wings of butterflies, dragonflies, cicadas, and in certain species of beetle. Structurally, it’s akin to photonics crystals. These materials boast a highly precise lattice structure that causes light to reflect off the surface in such a way as to create the perception of color in the human eye. They block certain frequencies of light and lets others through, so what color you see depends on the angle of reflection. But certain naturally occurring photonics crystals—like those found in the wings of kingfishers, or the Queen of Night tulip—don’t have the same dependence on viewing angle. They scatter light selectively, much like a diffraction grating. The effect is similar to what happens when light hits the tiny grooves etched into a CD, causing flashes of rainbow color. The interlocking barbules of peacock feathers also have this unique structure—hence their many-hued iridescence. Nell had photographed peacock feathers before, albeit at lower magnification. This time around, he wanted to capture more of that microscopic structure, showcasing “how each individual segment on a barbule can have a different color,” he told Gizmodo. He didn’t have an electron microscope, but his trusty Olympus BX 53 microscope proved up to the task. The instrument was limited in its depth of field, so in order to image the entire field of view, he used a technique called photo stacking: taking dozens of images from various focal points and stacking them together. Nell is a software engineer by day in British Columbia, but he’s been fascinated by photography since he was a child. It wasn’t until he bought his first digital camera in 2000 (a 2.1MP Fujifilm) that he had the chance to fully explore his creative inclinations. He’s been avidly taking photographs ever since,“from the tiniest bacterium to Venus in transit across the sun, and everything in between. You can see more of his work here.